Gothic designs have a unique charisma in them, although not many people like to incorporate the gothic theme in their bathrooms but when done, it not only looks exquisite but also has the old world charm to it. 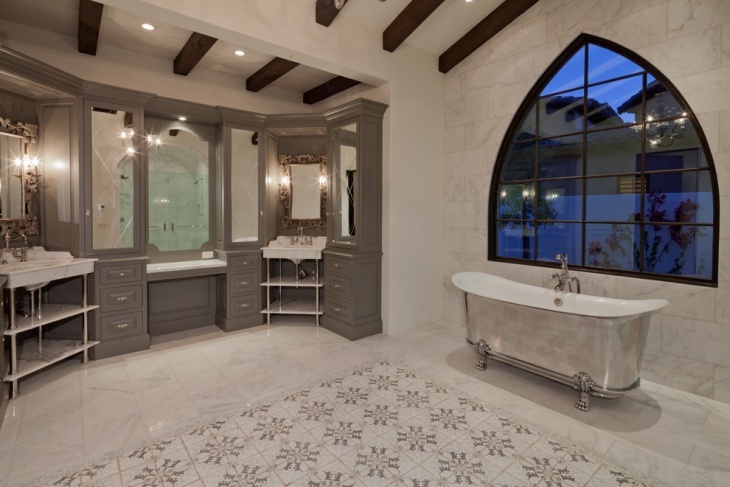 Generally, when we talk about the gothic design, only black color pops up in our minds but while incorporating a gothic design in a bathroom, colors like magenta, blue and purple are also common.Scroll down to see the list of breathtaking gothic designs in bathrooms. 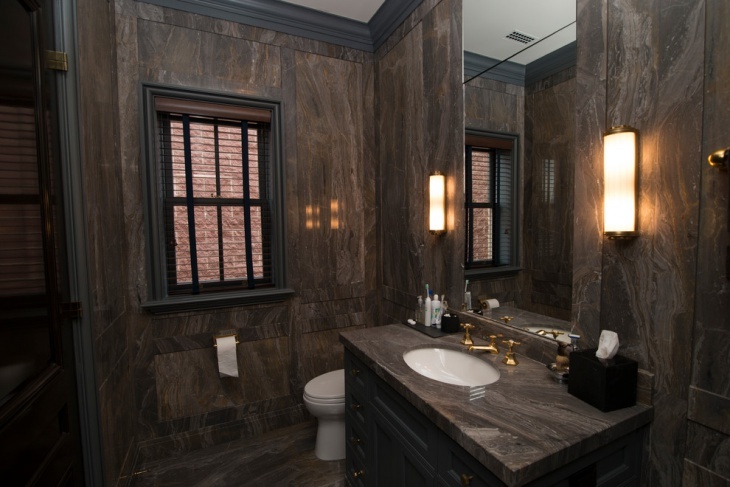 This beautiful gothic bathroom has matte gray walls with a pure white free standing claw foot soaking tub placed in the center and has natural stone flooring. It also features a round shaped mirror that reflects the large white chandelier. 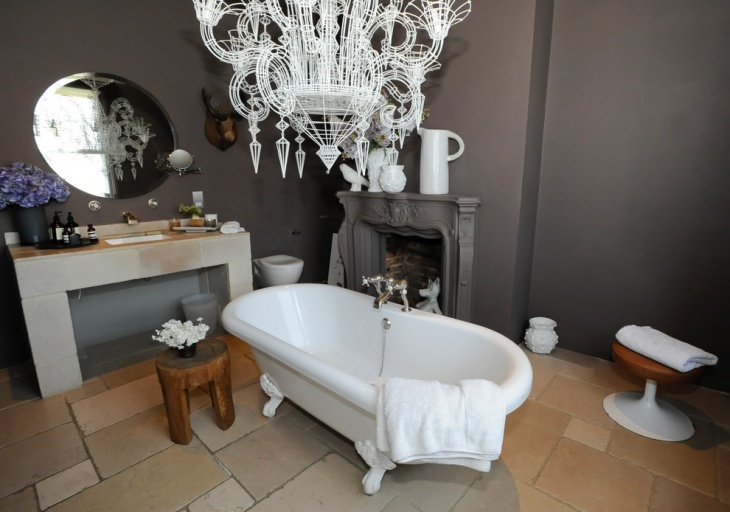 The white chandelier adds a glamorous touch to this gothic style bathroom. 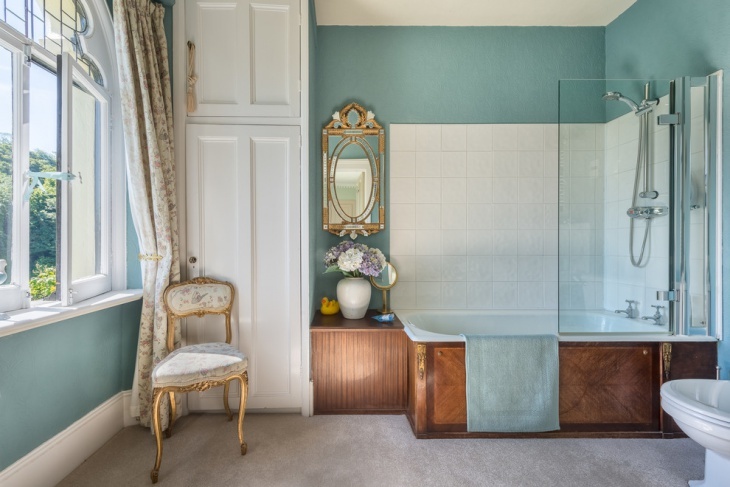 This Victorian bathroom in hues of blue mixed with white has a drop-in tub with a combo of shower right above the bathtub. 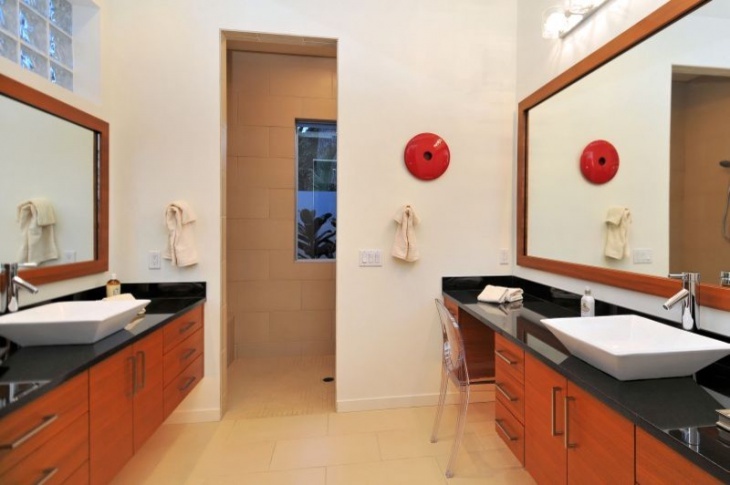 It has ceramic tile flooring and glass walls in place of curtains. The mix of wooden and aquatic blue shades complement this bathroom well. This Mediterranean bathroom with silver tiles and a dark wood ceiling is an enigmatic one, with shiny gray cabinetry and a silver bathtub which resembles Cinderella’s shoe, captures the eye of onlookers. 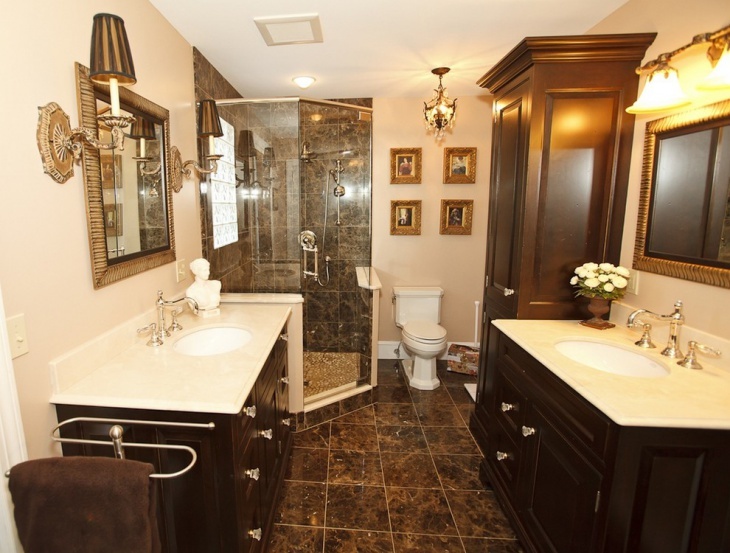 It is a beautifully designed bathroom with a gothic theme. 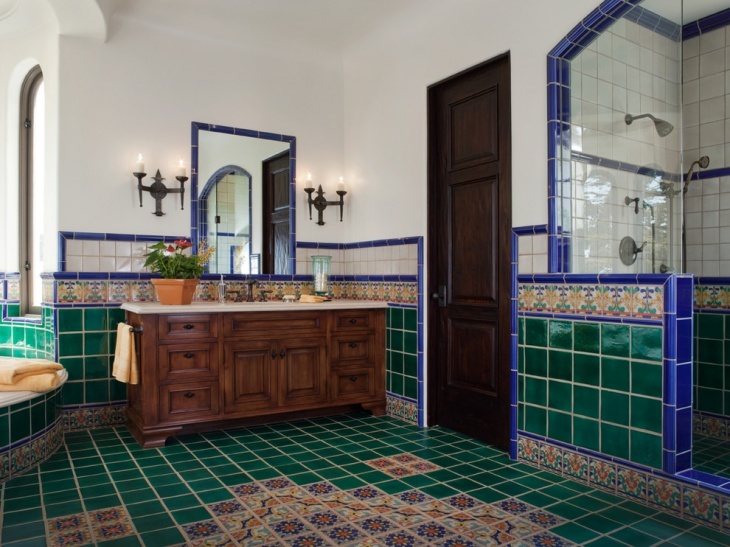 This bathroom features a splash of colors like green in walls and floor tiles with blue bordered tiles and that goes well along with the wooden cabinets. 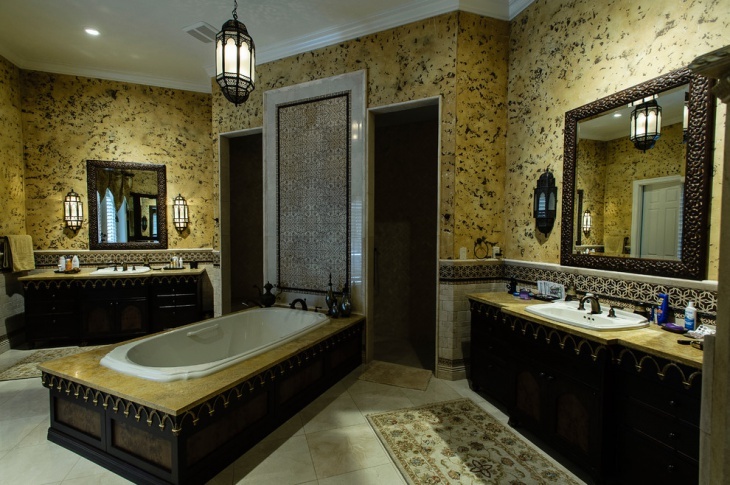 This is a vintage bathroom which has an ocean theme with gothic interiors like the lighting around the vanity and a gothic door. 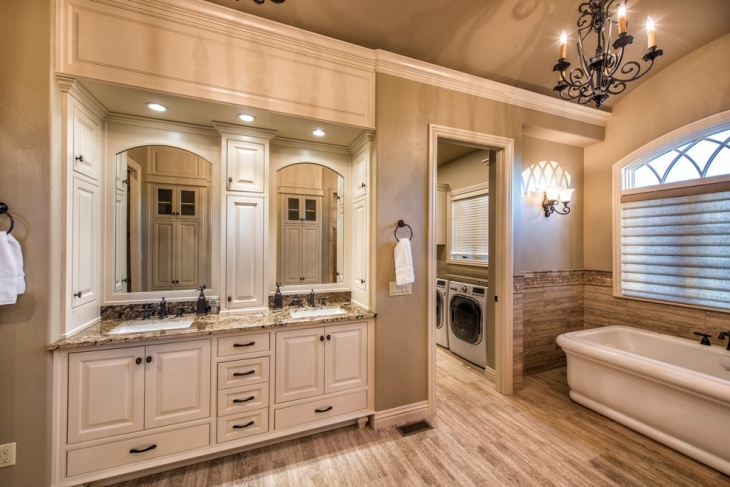 This beautiful spa bathroom has a rustic finish to it as it features a light colored wooden roof. 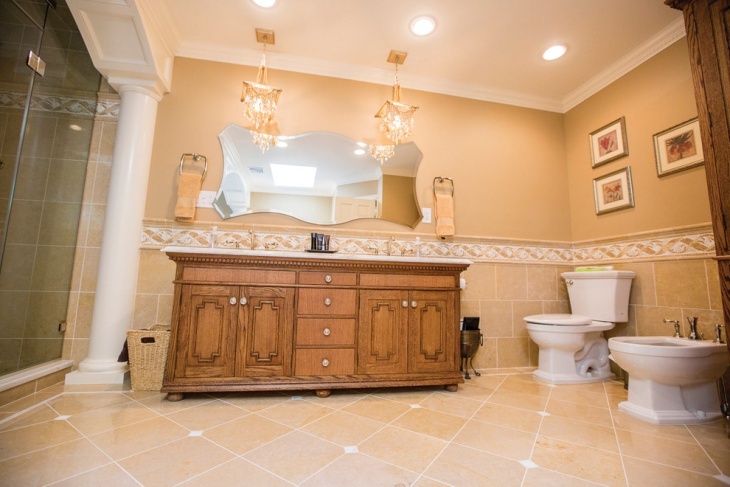 The beige tile flooring flatters with the cabinet stain and the interiors of this bathroom space. 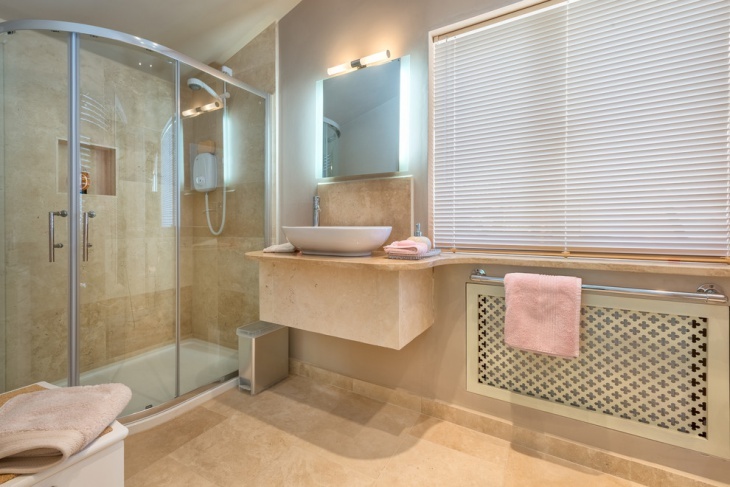 It also features an alcove shower and a drop-in tub which adds a bit of modern touch to this otherwise rustic bathroom. 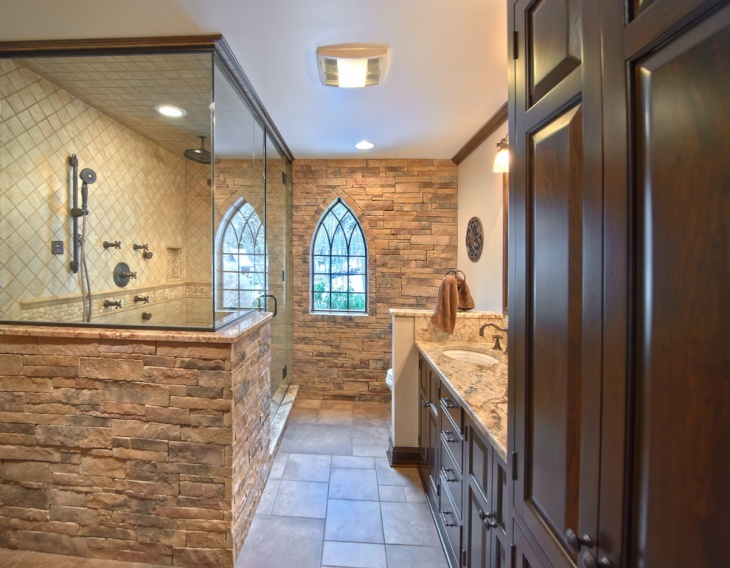 This traditional bathroom features stone wall along with a gothic style window and dark furniture which reflects the true gothic style. It has a steam shower area with a half glass and half stone walls. 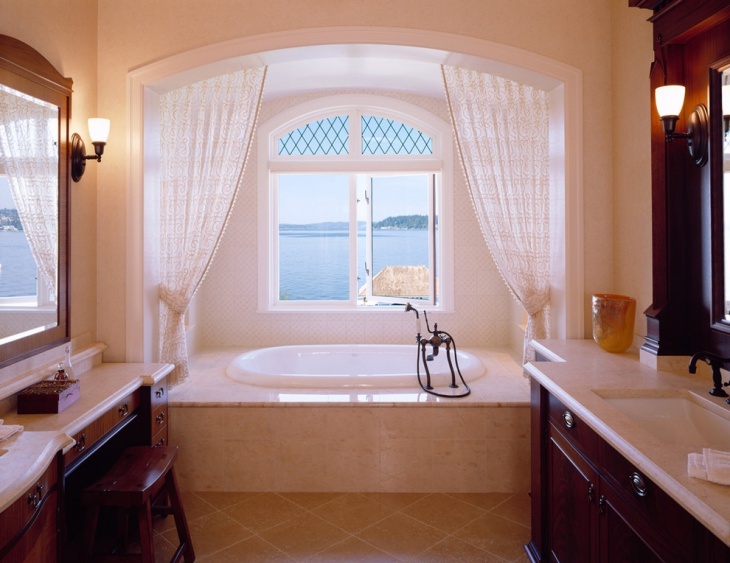 The stone wall theme alongside a gothic window calls for a traditional looking bathroom. 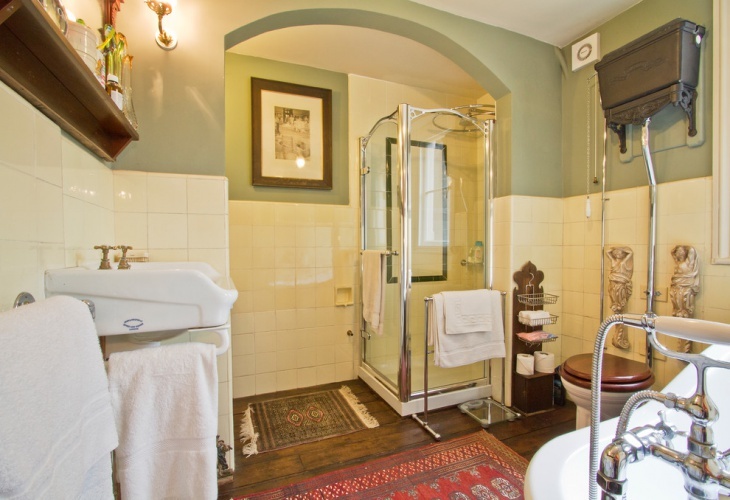 This is a Victorian gothic bathroom with a touch of simplicity featuring mini gothic printed rugs on the wooden flooring. It also contains ancient gothic style artifacts, a glass door shower area, shower towel rack and a holder for bathroom essentials in dark gothic brown. 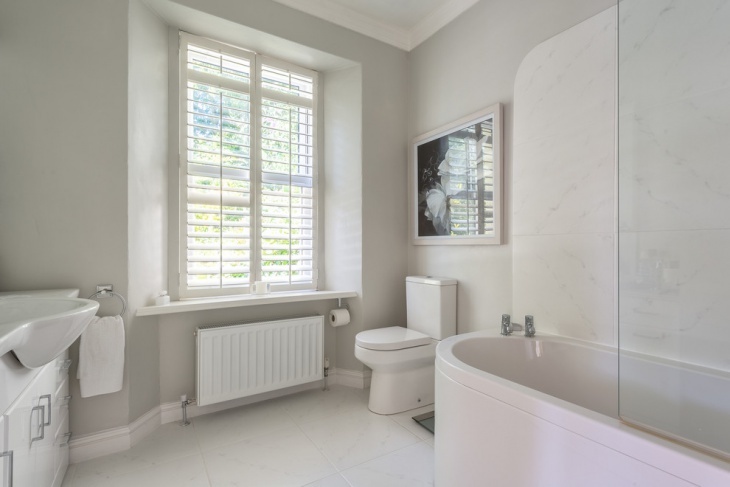 This contemporary gothic bathroom has a gold marble border in the walls, beige color of the wall paint goes well with the floor tiles. 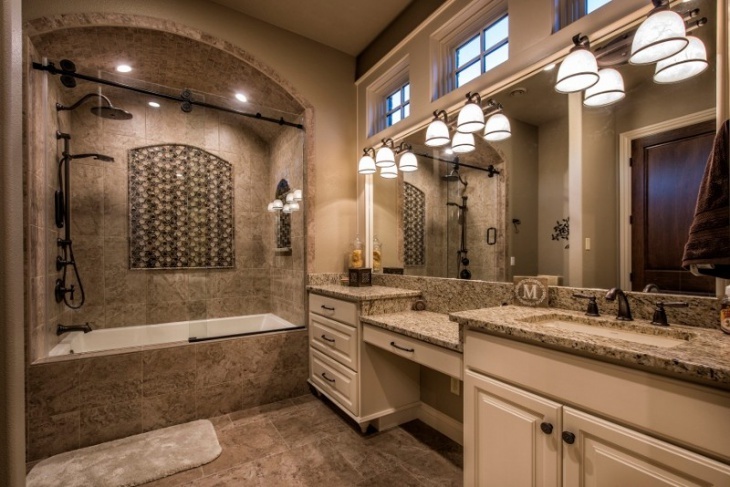 It features a wooden vanity alongside hanging lights in gothic designs. 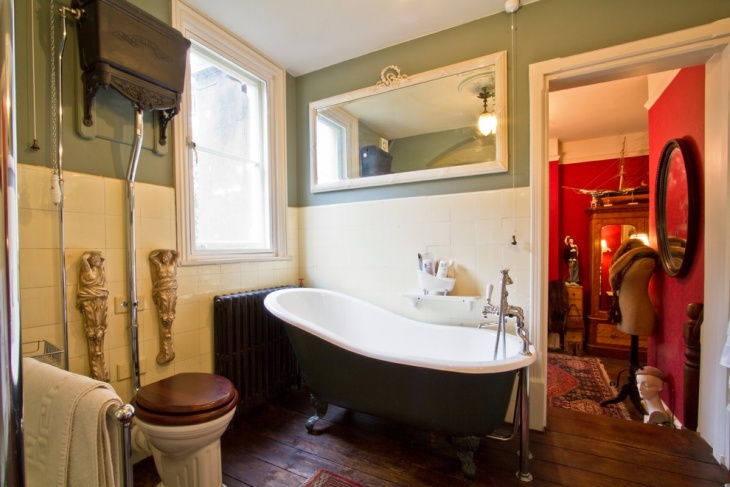 This vintage style bathroom has an old world charm with a gothic touch to it. The raised panel cabinets in white are paired with granite countertops and an under mount sink alongside ceramic flooring. 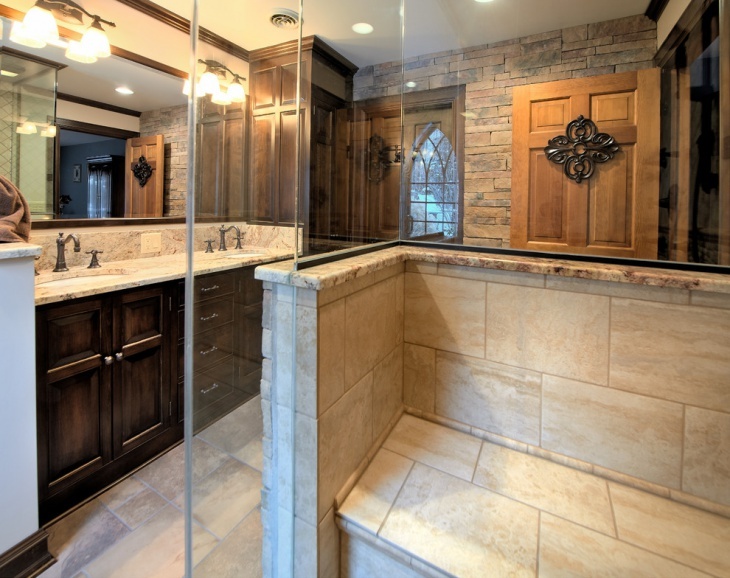 This unique gothic bathroom features a double vanity for him and her along with a built-in tub which is slightly raised. The walls are in a unique yellow shade with brown prints and gothic themed lights. 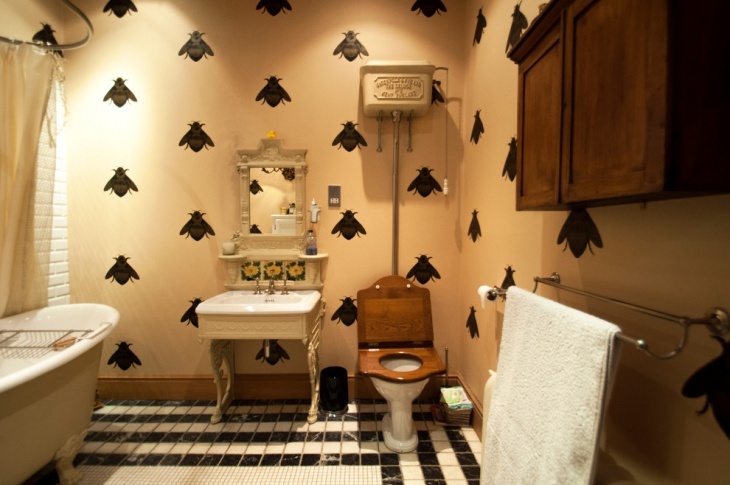 Gothic bathroom décor is dramatic and mysterious. Incorporating this theme in the bathroom looks truly unique and gives a break from the contemporary bathroom styles. Although the interiors, bathtubs, the lights etc used are all modern but the accessories and colors represent the true gothic look.